Do you have or want to start a podcast? Are you wondering how your podcast can lead to bigger things? 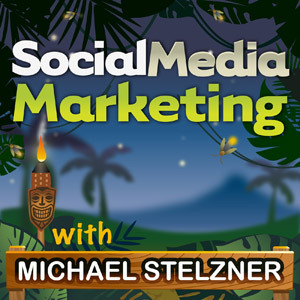 To explore how a podcast went from a hobby to a full-time business, I interview Lou Mongello for this episode of the Social Media Marketing podcast. In this episode, I interview Lou Mongello. 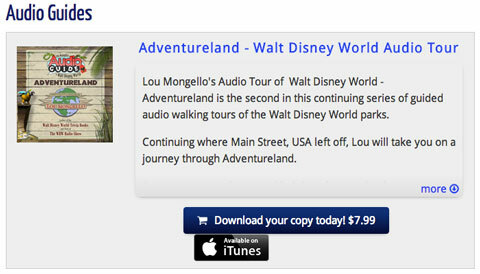 Lou hosts WDW Radio, a podcast focused on Walt Disney World, which has won Best Travel Podcast 8 years in a row. 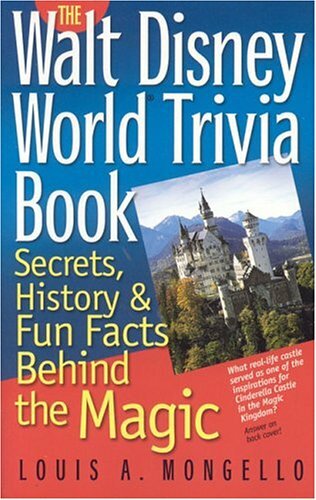 He’s also authored many Disney-related books including the Walt Disney Trivia Book I and 102 Ways to Save Money For and At Walt Disney World, and blogs at DWDRadio.com. Lou shares how he began pursuing his passion. 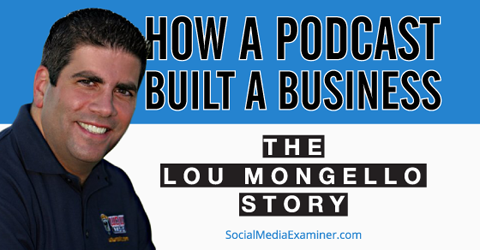 You’ll discover how podcasting helped turn Lou’s passion into a full-time opportunity. For a number of years, Lou practiced law in New Jersey and had an IT consulting company on the side, but always had a love for Disney and Walt Disney World. He’d been going to Disney parks every year since 1971 with his parents. Because he was in the service business, he had this idea for making something once and selling it. He shares that what he really knew all about was not law or computers, but Disney World. In 2002, Lou gave himself a personal challenge. He wanted to write a book, get it published and get it validated by somebody. When the book came out, he thought that was the end of it. But his two-page brochure website turned into articles, which turned into a thriving discussion forum. In 2005, Lou realized podcasting was more powerful than anything he could write. That’s when he started podcasting, doing videos, creating other products, doing events, etc. He’s been doing this full-time since 2007. Listen to the show to learn how Lou found a publisher to work with. When he started the book, he was on things like Usenet news groups and early discussion forums. He says this showed him there was a community of people out there interested in Disney in the same way he was. Because he was responding to so many similar emails, he decided to write the responses as articles (which is what blog posts were back in 2003). He also created a discussion forum on his site; 29 people signed up on the first night! That number organically grew from 29 to 1,000 to 5,000 to 10,000 to 50,000 and the community is still going strong. Listen to the show to find out what Lou built his discussion forum on. Lou says he started working on his second book the day after his first book came out. His community was very active and he shares that in 2005 he started hearing about podcasting and how anyone could use podcasting to broadcast their message. Lou launched the WDW Radio podcast in 2005. He shares that he started without knowing what he was doing and if or how people would find the show. Within the first week, the podcast had a few hundred downloads then a few thousand. Lou believes this is because people interested in Disney were and still are hungry for content. Listen to the show to hear Lou’s experience moving from the first wave of interest in podcasts into the second wave of interest. While Lou had things like AdSense and affiliate programs making some money on his website, it wasn’t enough to quit his job. Lou says he’d left his law practice and sold his IT consulting company. He had a good job as the chief technology officer for a medical imaging company and everything was going well. Lou shares that the game-changer came about 6 to 8 months into his podcasting when someone called and asked about sponsoring his show. That’s when he saw a way to turn his hobby into a business. After several months of flying from New Jersey to Florida 1 to 3 times a month, Lou says he realized he needed to go all in. He confides that he didn’t set out with a business plan or figure out all the numbers. He just knew he needed to be in the same place as what he talks about, so he sold his house and moved to Florida. Listen to the show to discover how Lou chooses his podcast sponsors. Lou has now written two books, self-published a book, published and sold a print magazine and created several products like his audio tours. He does live events and a lot of in-person events with his audience. Lou sells a number of audio tours. Lou discloses that he doesn’t work for and isn’t paid by Disney; he pays full price for his tickets and his meals. Everything he says and does is because he’s a fan first. He says his secondary and tertiary businesses have grown from that. Lou talks about which doors have been opened for him through the podcast and why he believes podcasters can offer something to a brand’s fans that the brand itself can’t. Listen to the show to find out what advice Lou shares with kids about starting something they love. Each show begins with an intro that sounds like the tuning of a dial. Lou does this to invite listeners in, to get them in the mood and make them smile when they hear a familiar song or saying. Each week’s episode features vacation planning tips, an interview, history, trivia or a deep dive into an attraction. Lou also does live restaurant reviews so listeners can hear the ambient sounds of music in the background and forks clinking in the foreground. His goal is to make people feel like they’re sitting at a restaurant table talking with good friends about something they all love. The content-heavy show is very conversational and runs about an hour. Lou publishes an audio broadcast every week, a live UStream every Wednesday and a video every week. 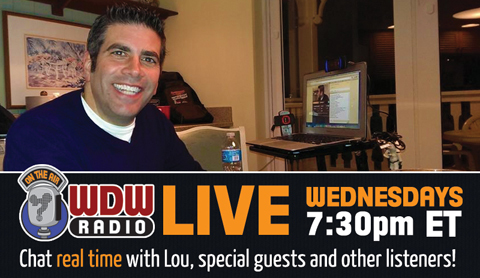 Listen to the show to discover how Lou handles live recording inside Walt Disney World. Lou shares why he treats his listeners as friends. He replies to every email with a personal response. He’s part of the conversation on a number of social channels because he believes in creating content that people are comfortable consuming. To make sure listeners feel they’re a part of the community, Lou answers emails on the show, plays and responds to voicemails on the show and encourages people to send in selfies for Self-Shot Tuesdays on his blog. Lou meets up with his listeners every month. Listen to the show to hear why Lou has held live, in-person monthly meetups since January 2008. Lou says don’t worry about the tech. He shares the most important thing is to have passion for the subject of your podcast. To get started, Lou says to grab your headset and your computer then start recording. He recommends publishing three to five episodes before you launch. This lets you find your voice, gain rhythm and get on a schedule so you deliver consistently. Lou also suggests not to watch the numbers. He thinks numbers are important when you talk to sponsors or for demonstrating social proof, but that you shouldn’t check on your audience size every day. If you have five listeners, Lou says treat them like 5 million. They’ll hear it, appreciate it and become your most loyal evangelists. Listen to the show to learn why passion is the key to a successful podcast. Find out how a podcast build a full-time business. Is your computer a little slow? Have you noticed that it seems pokey when you go on the Internet? You might have malware and/or Trojan horses on your computer. We Mac users tend to think our computers won’t ever have a virus because we don’t hear about them occurring as much as we do with Windows. I use a Mac and recently found tons of malware on three of my computers. Download and run ClamXav to scan your Mac. If you’re a Windows user, run Malicious Software Removal from Microsoft. Because I’m on a Mac, I ran ClamXav. It took some time, but the scan found a couple of hundred instances of malicious code, Trojan horses and malware in my email, in downloaded files and in my browser files. I was shocked! Today’s show is sponsored by Social Media Success Summit 2014. This is our largest online event. It’s completely online, so no travel involved. There will be three sessions each day spread over an entire month. Each day has a theme, like LinkedIn. To help you do everything you could be doing with your LinkedIn marketing, we have some spectacular sessions lined up. If you’re looking to grow more business with LinkedIn, check out How to Use LinkedIn to Find Valuable Prospects by Viveka Von Rosen. Is part of your business to connect with people who might lead to more opportunity for you down the road? Don’t miss How to Improve Your LinkedIn Networking by Stephanie Sammons. Do you want to be found when people search for a specific topic on LinkedIn? Be sure to catch How to Optimize Your LinkedIn Profile to Generate More Leads for Your Business by Melonie Dodaro. These are just a few of the experts who will teach you how to market on LinkedIn and other social channels. If you want to learn more, visit here where you can check out all of the speakers and the agenda. Make sure you grab your ticket before the price goes up. We’ve got a lot of earlybird sales going on right now. Check out the WDW Radio podcast. 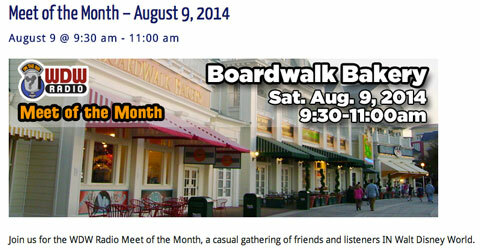 Explore the WDW Radio blog. Learn more about Lou’s books and audio tours. Find WDW Radio on Facebook and YouTube. Follow Lou on Twitter, G+, Pinterest and Instagram. Use ClamXav or Malicious Software Removal to scan your computer for viruses. 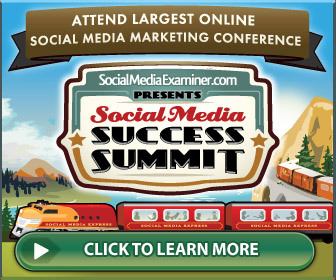 Learn more about Social Media Success Summit 2014. What do you think? Are you interested in podcasting? What are your thoughts on how podcasts can build a business? Please leave your comments below.